Designed to compatible with the size of Canon PIXMA iP110 and PIXMA iP100 portable printer (size without battery). Protect your printer, power adaptor out of scratches. This case will help you organize your belonging, place your device in order and save your space in your travel. Two bands with velcro enclosure inside the bag - separate the interior space as two parts. Bigger for the printer, the smaller part for the charging adapter. External pocket to store the cable, very convenience. Zipper enclosure, security and easy access to your device. Made of premium soft Neoprene material, Protect your printer, power adaptor out of scratches. Package included the neoprene case only, the printer and charging adapter and cable are not included. "COSMOS" is a registered trademark with the USPTO in USA. 'Cosmos Tech & Leisure' is the ONLY Authorized Distributor for "COSMOS" products. The product shown on pictures & images are from 'Cosmos Tech&Leisure'. Designed to compatible with Canon PIXMA iP110 and PIXMA iP100 portable printer. This product is a carrying case bag only, printer is NOT included. Two bands with velcro enclosure inside the bag: Separate the interior space as two parts. Bigger part for the printer whilte the smaller part for the charging adapter. External pocket to store the cables and other accessories. Zipper enclosure, security and easy access to your device. Made of premium soft Neoprene material, Protect your printer, power adaptor out of scratches. 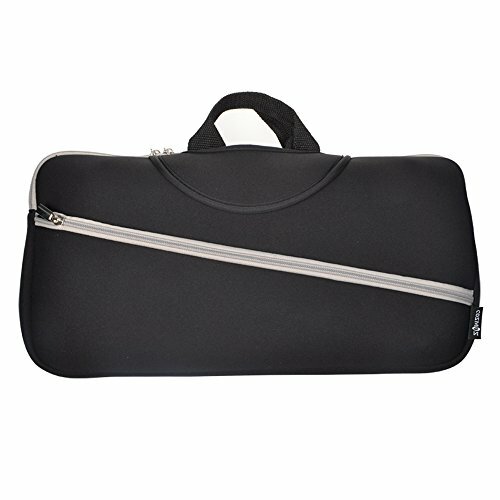 This product is a carrying case bag only, printer is NOT included.